The San Juan rabbit is a domestic rabbit that has been bred to mimic the traits of the cottontail. They are a popular choice for training hunting dogs, are tame enough to make decent pets and they can be used to provide a family with a source of low-fat, low-cholesterol meat. Cottontails are their wilder cousins, and as such they are faster, less likely to be tame and much more likely to bite when being handled. Beyond these basic personality differences, the two are very similar and have the same fundamental requirements for care and keeping. Construct or purchase proper housing for your rabbits. Individual pens are the safest bet to avoid unwanted breeding. Part of the floor should be made from ¾-inch wire mesh, which will allow waste to fall through onto the ground below. Alternatively a tray can be attached beneath the wires for easier clean up. The other half of the cage should contain a solid den, or sleeping quarters, lined with fresh straw with a door opening out to the wire portion. The cage should have a waterproof ceiling, a feeding dish and a water bottle. And all cages need sturdy hinges and secure closures at the access points. Build a rabbit run. It doesn't have to be anything fancy, just an area for your rabbits to get daily exercise. If at all possible, it's best to construct tunnels to rabbit cages, connecting the two. However, if this is impossible, simply build a run in your yard and carry the rabbit to it. Make sure it is safe and secure to prevent escape or attack by predators. Situate the run in a shady area and make sure there is an accessible supply of water. 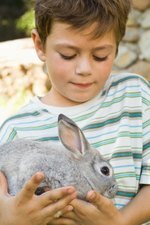 Purchase rabbits from a reputable breeder. Do an online search or attend the county fair and check out the rabbit exhibition. The number of rabbits you begin with is a matter of personal preference, but bear in mind, each female can have three or four litters of young every year and litter sizes range from five to 10. You should have one boy (buck) for each girl (doe). If you do not keep your rabbits in separate cages, remember that they will reach maturity at around eight months of age and mature does ovulate immediately after mating. Also, if you leave more than one buck in a cage, upon reaching maturity, one will castrate the other. Make a record of which doe is bred by which buck and keep rotating them to maintain a healthy population. Bear in mind, if you have both San Juan and cottontail rabbits, they will not breed with each other The San Juan looks like a cottontail, but it is not. Feed your rabbits. Each bunny should eat ½ cup of commercial rabbit pellets each day, gradually increasing the amount to 1 cup when adult size is reached. Additionally, rabbits enjoy a wide variety of fresh produce, such as carrots, spinach, broccoli, apples and strawberries. In winter, they will nibble on hay (alfalfa, red clover or timothy). Fill bottles with fresh water daily. Handle your rabbits every day, though with cottontails this will be more of a challenge as they are hard wired to be afraid of you. Put on a pair of protective gloves and a long-sleeved shirt. Grab the loose skin between their shoulder blades with one hand and lift, supporting their body weight with the other. Hold the rabbit close to your chest, wrapping your arm around it's midsection--do not let go of the nape of the neck until the rabbit becomes accustomed to being handled. Clean cages at least once a week. Remove any droppings, uneaten food, or soiled bedding. Remove the food dish and the water bottle. Wash everything and rinse in a mild disinfectant. Allow everything to air dry and replace. Rake up any accumulation of droppings or remove the catch tray and empty it. Wash the tray with soapy water, then treat with disinfectant. Can Birds, Rabbits & Dogs Live in the Same House?